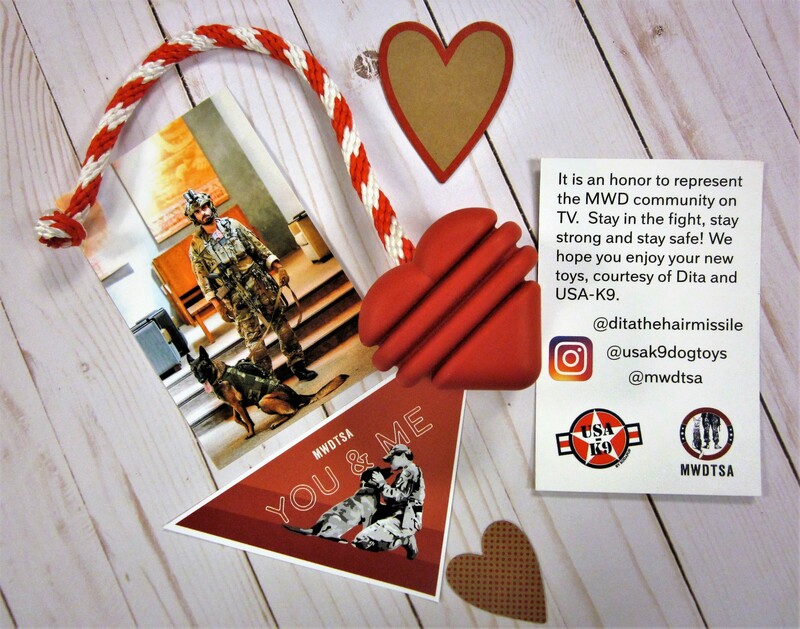 MWDTSA formally acknowledged Valentine’s Day with its Q1-2019 care packages. It’s been over 10 years since we’ve featured hearts and romance in our boxes. While “romance” might be too strong a word, we set out to honor the timeless bond between handler and dog. It’s a special kind of love worth celebrating. We fiddled with a few different ideas. Shep-heart. Love-rador. 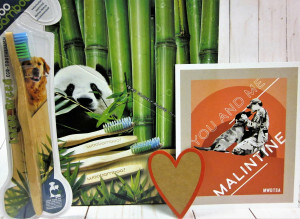 But we decided “You and me, Malintine” has a ring to it. 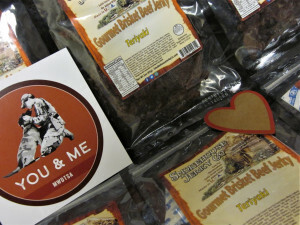 Knowing that some handlers’ partners are not Malinois, we stopped at “You and me” for the tactical patches. p.s. If you’d like to contribute to Q2 care packages, visit MWDTSA’s Amazon wish list or our web site. Thanks for helping us support both ends of the leash. Rex Specs dog goggles are high-quality protective eyewear for the active and working dog. 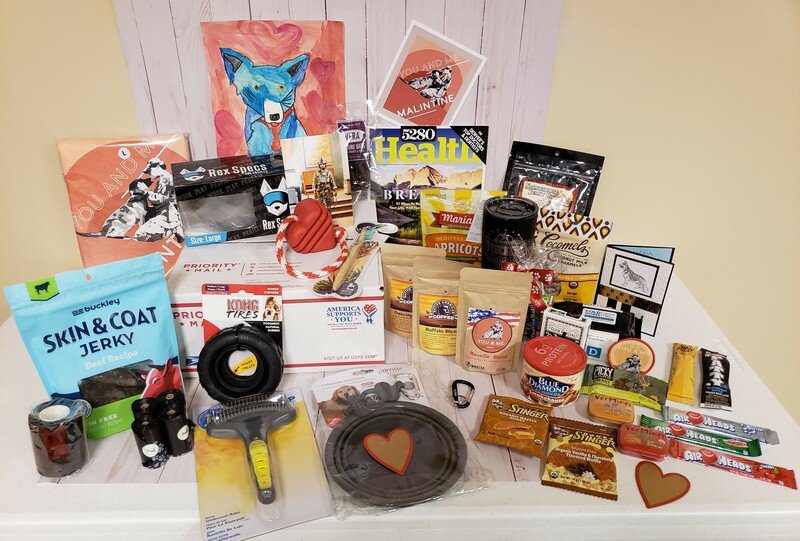 They typically retail for $80, but this holiday season, the company is hosting a donation drive for the Military Working Dog Team Support Association (MWDTSA). 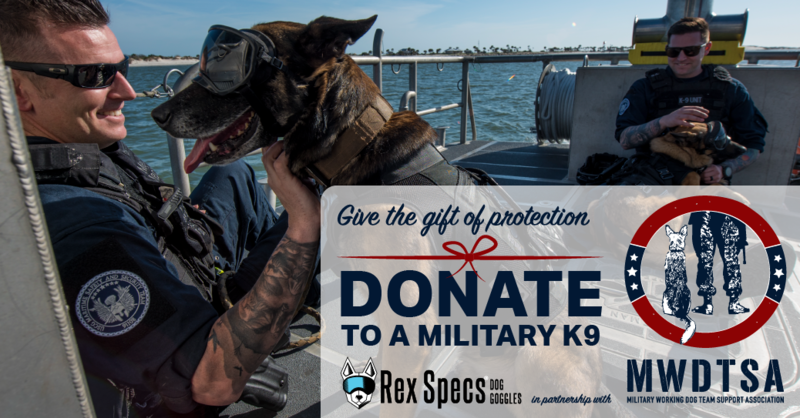 If you donate $40, Rex Specs will work with MWDTSA to deliver protective eyewear for a military working dog deployed in a global combat zone. This year, we have set the goal to include Rex Specs in all 200 Q1-2019 care packages that MWDTSA will ship out in February. These goggles shield the eyes of MWDs from helicopter rotor wash, desert sand storms, winter blizzards, and other environmental hazards. With the holidays coming up, it’s a great way to honor our nation’s four-legged heroes. MWDTSA had the opportunity to talk with Rex Specs co-founder, Jesse Emilo, to discuss the need for K9 eye protection. Q: In what situations can dogs benefit from protective eyewear? A: In any situation where humans wear eye protection, it’s important to consider whether a dog also needs eye protection. UV rays, dust, dirt, debris—and even grass, seeds, and sticks—pose potential hazards for dogs. Canines living at high altitude and in sunny environments experience intense and prolonged UV exposure that can harm their eyes. In some cases, time in the sun can aggravate existing medical conditions such as iris atrophy or pannus. 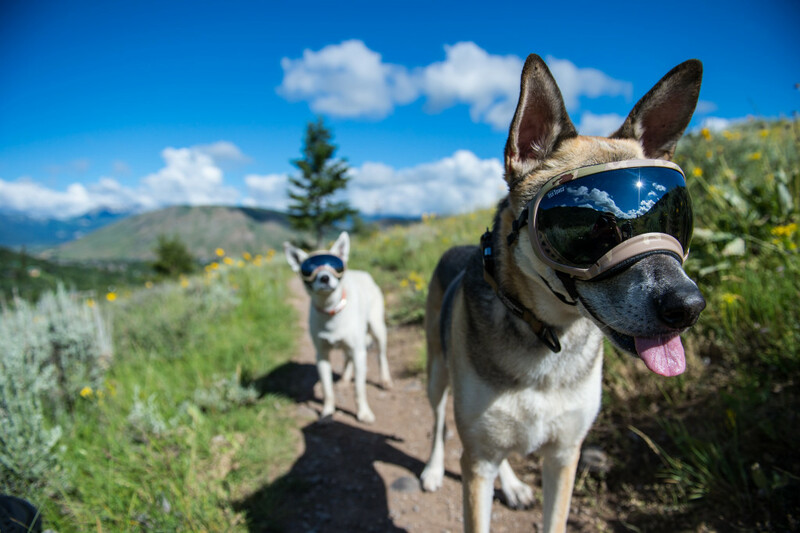 Goggles provide UV protection so that a dog’s time outdoors does not need to be limited or restricted. Dogs that are deployed from helicopters (MWDs, Police K9s, Search and Rescue, etc.) or that live and work in areas with lots of particulates use goggles to help protect from foreign objects getting into the eye. There are dogs that accompany their handlers in unique situations and environments, such as chemistry labs or welding shops, where eye protection is worn by all—so why not the dog? Many dogs wear goggles for protection while sticking their head out the car window or while riding in a motorcycle sidecar. Whether your dog’s eyes are healthy or they suffer from an eye disease, many people choose to protect their four-legged companion’s eyes before an injury occurs. 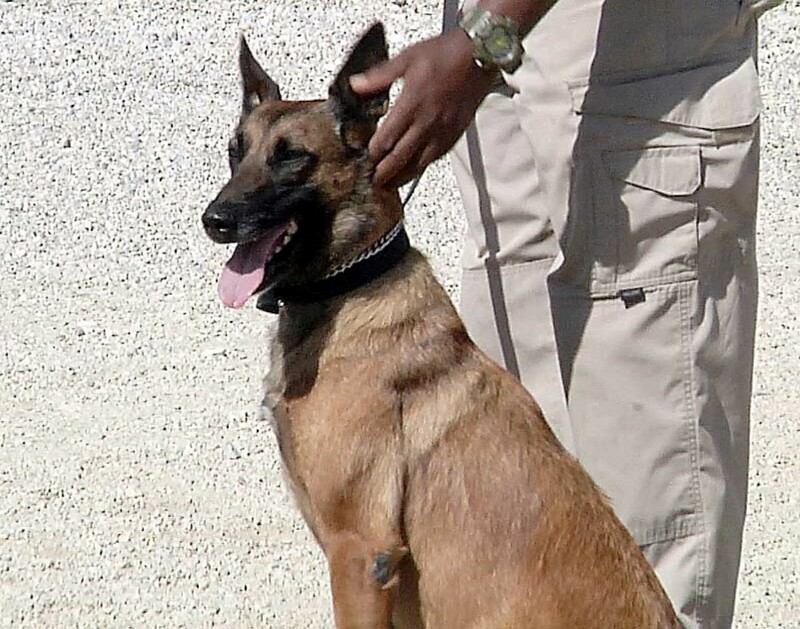 Working dogs such as MWDs, hunting dogs, and other highly trained K9s have hundreds or thousands of hours of training. An eye injury could end their career. Rex Specs act as insurance to protect your partner from eye harm. Q: What are the risks dogs (and their owners) face if a dog does not wear protective goggles? A: Some dogs have eye conditions that are genetically inherited, and some face on-the-job or other environmental hazards. The risks associated with not wearing goggles depend on the circumstances. One of our dogs, Yaz, lacks pigment around the eye, resulting in severe sunburn when outside all day. Her eye would get red and puffy for a few days after being in the sun for too long. Sometimes, she would even develop a scab on her eyelid. At the age of 8, she needed entropion surgery on the eye. The surgery was costly, and we felt badly about bringing her on all-day outdoor adventures without protecting her eyes—before and especially after surgery. Now that we have Rex Specs, we can bring her along on the boat or out in the sun for a long day, with confidence that she’s O.K. Our other dog, Tuckerman, was diagnosed with pannus at the age of 2. It’s an autoimmune condition that affects the cornea (the clear) part of the eye. If left untreated, it eventually can scar the eye so badly that it causes vision impairment or blindness. This condition can worsen with UV exposure. One treatment for pannus is daily steroid drops. This prescription is not cheap when accumulated over a lifetime. Goggles are a less expensive alternative. Tuckerman still has pannus, but at the age of 9, he’s doing well. With his Rex Specs, we feel good about bringing him on long runs and adventures, knowing he’s protected from UV rays. Q: Some dogs swipe their eye area with a paw in an effort to remove an irritant. What other signals/symptoms should dog owners watch for that might indicate an eye injury or irritation? A: Wiping or pawing at the eye should definitely trigger owners to take a closer look at their dog’s eyes. Other signs of possible irritation include discharge, redness, or swelling. If you suspect something is wrong with your dog’s eye, document the issue, take photos, and check it frequently. If it’s becoming worse or not improving, consult your veterinarian. Eyes are sensitive and delicate. It’s better to be safe than sorry, so call your vet if you have any questions or concerns. Treating an injury early can help keep the pain down, expedite the healing time, and minimize the cost associated with the injury. Q: Are there any basic first aid/home care tips that owners should know when caring for their dogs’ eyes? In addition to goggles, are there any particular dog eye care supplies owners should always have on hand? We recommend giving your dogs an overall checkup quite often, and particularly after they are exposed to harsh environments or show signs of possible injury. Check their entire body, not just their eyes. Bird-hunting dogs, for example, often run through tall grass and thorny weeds. Look closely at their paws, bodies, faces, and eyes to make sure there are no scratches, or embedded debris or grass seeds. One thing that’s nice to have on hand is saline solution, which can be used to rinse or flush a dog’s eye. Q: What are common mistakes dog owners make when caring for their dogs’ eyes, and what should owners do instead? A: The most common mistake might be not giving your dog’s eyes the attention they deserve. Most medical conditions get worse over time and are easy to miss if you’re not keeping an EYE on your four-legged companion. We have a lot of customers who say, “If I had only known earlier,” when they find out about a condition or injury. Regularly check your dog’s eyes, ears, paws, nails, and body. If you see something different or something that has changed, take note and keep track of it. The more information and awareness you have from the start, the better your vet might be able to treat an injury or symptom. Also, ask your vet to examine your dog’s eyes during annual checkups or if you suspect something is wrong. Nobody knows your dog as well as you do—trust your instinct if you feel something is off. MWDTSA is grateful for Rex Specs’ ongoing support of our nation’s military working dogs. We thank you, our readers, for supporting this year’s Rex Specs drive. 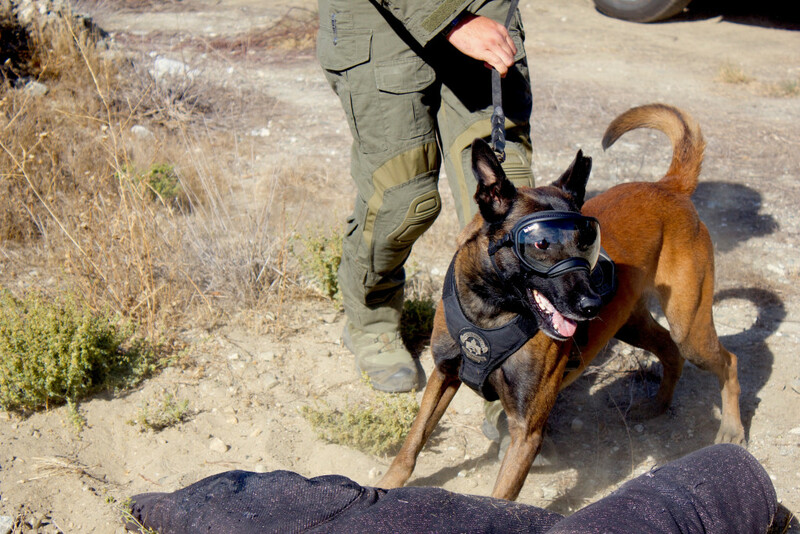 These goggles protect MWDs’ eyes from harsh elements, so they can work more comfortably and safely. 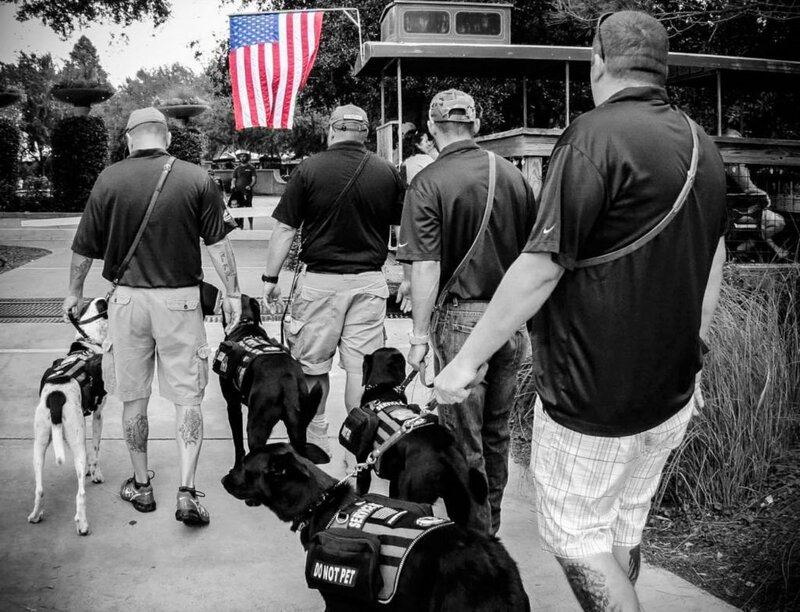 Let’s set a record and send a spectacular number of Rex Specs to these intrepid four-legged service members. Here’s how. 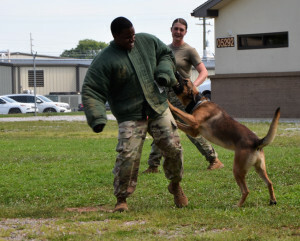 Don’t mess with a military working dog. A rabid raccoon learned this the hard way when it ventured into a kennel at Fort Huachuca. The dog quickly dispatched the invader and thankfully did not contract rabies. The incursion, however, led to the installation of sturdy red iron gates to deter wild critters from entering. MWDTSA heard this and other stories during a recent visit to Fort Huachuca. Our nonprofit travels to stateside kennels to provide moral support and say thanks to military working dog teams. These handlers and dogs work tirelessly in a variety of roles, including explosives detection, drug detection, and patrol. They face challenges ranging from extreme weather to snakes (including one killed in the area that morning). 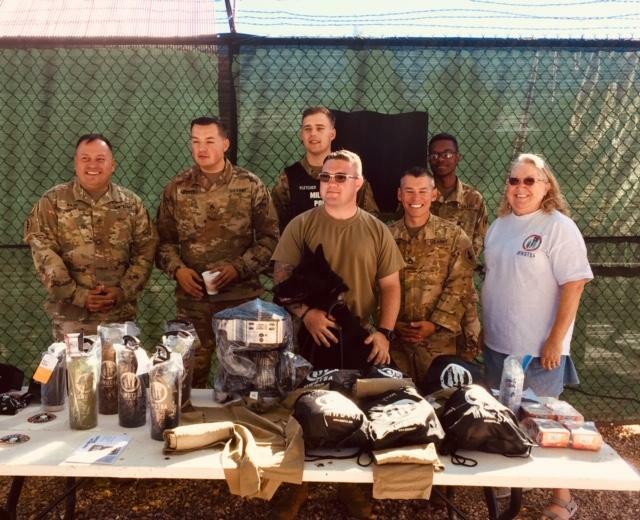 Fort Huachuca handlers and MWDTSA volunteer Linda Costa-Bryan stand with MWDTSA kennel gifts. Pictured left to right (back row): SSG Razo, SSG Andrews, SPC Fletcher, and PFC Jackson. Front row: SPC Harmon, SFC Peppersack, and Costa-Bryan. MWDTSA volunteers Linda Costa-Bryan, Scott Bryan and Bill Cummings arrived at the base with breakfast and gifts. Donors’ generous financial contributions made all of this possible. Handlers enjoyed coffee, juice, fruit, assorted pasties, and donuts. Volunteers presented a new coffee maker and bags of Dunkin Donuts coffee. Handlers received MWDTSA t-shirts, blender bottles for protein drinks, MWDTSA patches, and Fifty/Fifty bottles. For the dogs, MWDTSA delivered KONG Classics, KONG Squeezz sticks, dog bandanas, collapsible dog bowls, and Planet Dog Orbee footballs. Thanks to the steadfast support of Planet Dog, each MWD also received a Planet Dog Orbee baseball. These toys are perennial favorites among MWDs! KennelSol graciously provided a bottle of kennel disinfectant for this visit. While MWDTSA’s main goal is celebrating the handlers and their four-legged comrades, our volunteers also learn a great deal about training, local challenges, deployments, and military history. A kennel visit typically includes skill demonstrations and a facilities tour, along with a chance for Q&A. Our volunteers learned the Army originally established Camp Huachuca in 1877 to “offer protection to settlers and travel routes in southeastern Arizona.”1 It was re-designated as a fort in 1882. MWDTSA volunteer Cummings of Marana, Arizona served as a USAF Vietnam-era Sentry Dog Handler. 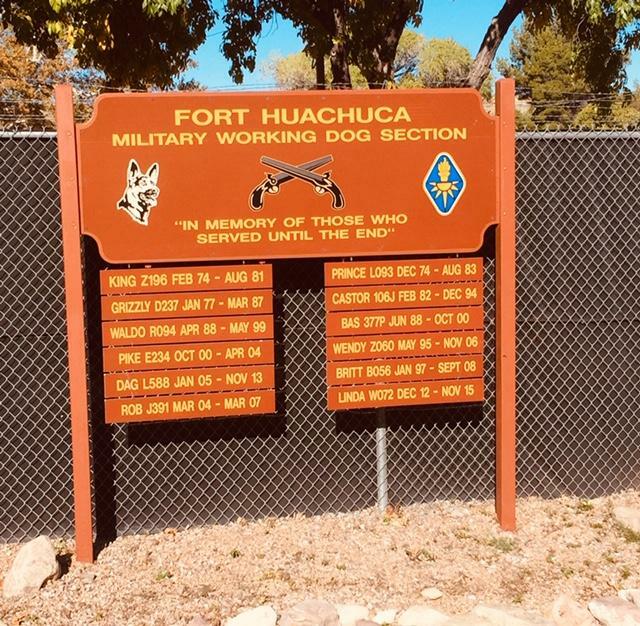 He and the Fort Huachuca handlers discussed how dogs’ roles in the military have shifted over time as missions have changed. “Today’s dogs do so much more,” he noted. PFC Jackson and MWD Roxie perform a training demonstration for MWDTSA volunteers. Linda Costa-Bryan remarked that she had never seen artificial turf in a kennel training yard. This led to a discussion of the hot climate. Fort Huachuca handlers work with their dogs early in the morning, because the sunbaked terrain can scorch a dog’s paws in the afternoon heat. Anyone who has visited a military kennel can attest to the wisdom of ear protection. When visitors enter, the whole kennel often erupts in a cacophony of ferocious barking. Cinderblock walls and cement floors amplify the volume. So, MWDTSA volunteers were surprised at the (relative) quiet of Fort Huachuca’s kennel. “That’s because we just fed the dogs,” explained SFC Mathew Peppersack. During the visit, two handlers mentioned they had received MWDTSA care packages during previous deployments. Both had been surprised to get boxes and said it felt nice to be remembered while in a combat zone, away from their friends and family. MWDTSA thanks you, our generous donors, for making these care packages and stateside kennel visits possible. We are grateful for your support! It takes a village to fill our quarterly care packages and fund our stateside kennel visits. To learn how you can help, visit https://mwdtsa.org/donate/. Thank you! BAGRAM AIRFIELD, Afghanistan—These dogs’ noses save lives. But aside from an ultra-sensitive nose, the dogs must have traits of absolute obedience, discipline and loyalty. And more smarts than can be imagined, along with the power to take down an adversary if necessary. These are only some of the qualities the dogs here must possess in order for them to assist in the U.S. Forces-Afghanistan and the NATO-led Resolute Support mission. The breeds of the dogs at the kennel complex are German Shepherds and Belgian Malinois. While Shepherds are more muscular, the Malinois does not lack for strength. Both are ideally suited for security purposes. 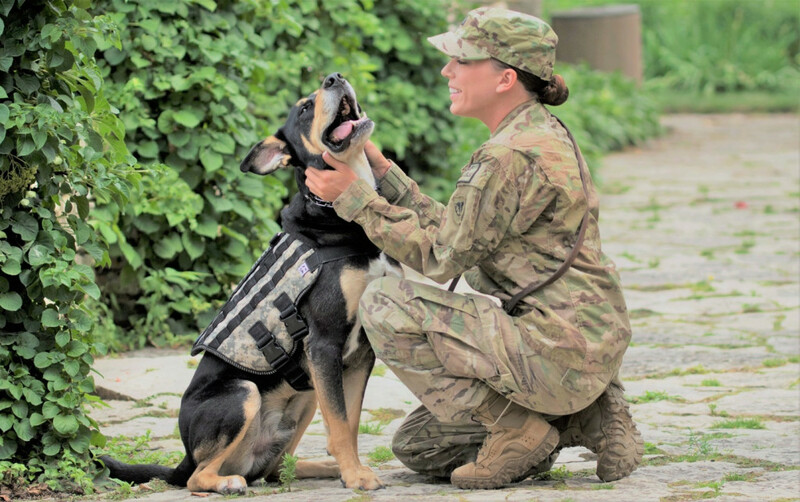 The dog teams—consisting of handler and dog—provide direct counter to Improvised Explosive Devices, the enemy’s weapon of choice. Detection improves mission effectiveness and reduces IED-related casualties. A dog’s nose is the key to sniffing out bombs inside and outside the wire, Ogle said. “There’s no substitute for the detection of a dog,” says William Cronin, director for American K9 for Afghanistan and Mali, West Africa. Cronin has been in his position for five years working out of Kabul, Afghanistan’s capital. 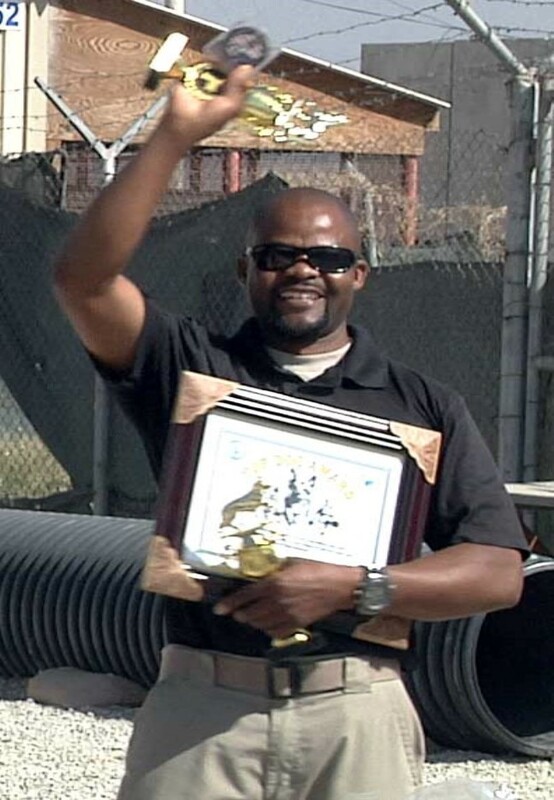 He was at Bagram Airfield to see some of his dogs carry out their skills in a two-day K9 competition in mid-September. The company’s headquarters is in Moyock, North Carolina, and part of a bigger organization, Constellis. That company is a leading provider in risk management and operational support services to government and commercial customers, according to its website. AMK9 has more than 25 years of experience in training and staffing highly qualified detection dogs and handlers with the ultimate goal of quickly implementing and sustaining K9 operations in high-threat, complex locations worldwide, the website stated. And, AMK9 has been working with U.S. forces in Afghanistan and Iraq since 2004. The dogs are of the highest quality with proven working dog bloodlines from European sources. In fact, less than 10 percent of the dogs screened will pass the initial evaluation and be approved for training at AMK9 facilities, according to the organization’s website. Ogle explained the competition was to build morale, sharpen the dogs’ skills, and enable better dog teams. “This actually sharpens their skills because these teams have been preparing for a month and a half to get ready for this competition,” Ogle said. The first day tested the teams on explosives detection. The dogs had to find two explosives placed on a possible 10 vehicles with distractors such as foods like bacon and sausage. In this timed event, most dogs averaged about two minutes to find explosives, Ogle said. The second day tested obedience. Situations were created to see how obedient the dog was to his handler regardless of what was going on, i.e., a man in a padded suit trying to get the dog’s attention resulting in an attack. In the end, handler Frank Musoli and his partner, Tina, took the most honors with the top Overall Dog Team and also received a second place in the Detection category and third in the Obedience/Controlled Aggression Category. Musoli is from Kampala, Uganda, and has been a dog handler serving in Iraq for five years and now in Afghanistan for five years. “We are a team. Me and my dog are a team. So, we work hard,” Musoli said. Asked what he thought of having a non-computer job while helping to save lives, Musoli said he recognizes how vital such a job is to the mission in Afghanistan. “It doesn’t mean I’m only here for money. I’m here to support the U.S. Army … we are in it for peace. We make sure our people in the FOB (Forward Operating Base), stay alive,” Musoli said. “I make sure when I’m out there at the checkpoint, I make sure I focus on what took me there. I make sure people’s lives—the generals, colonels, other guys and civilians—are safe,” he said. So, between man and dog, IEDs do have an enemy. This article and a slide show originally appeared here. Many thanks to author Jon Micheal Connor, Army Public Affairs, for inviting MWDTSA to repost. MWDTSA sends quarterly care packages to military working dog teams (dog plus handler) deployed in global combat zones. We are currently collecting items for our Q4-2018 boxes, which will ship on December 1. You can contribute by visiting MWDTSA’s Amazon Wish List. It’s a quick, easy way to say thank you to these intrepid teams. During a recent MWDTSA visit to Fort Campbell, this young team provided a great demo on the obstacle course. We coordinated the event with the Kennel Master (KM), a friend whom MWDTSA supported on his last deployment to Afghanistan as a dog handler. He no longer holds the end of a leash but, in his role of Kennel Master, embraced plans for our first Fort Campbell visit. The Army, however, stirred the pot and just days before our arrival, promoted him to a new assignment and installed a new KM, SSG IaFelice. Fortunately, SSG IaFelice hit the ground running and our plans never wavered. It was especially reassuring to know that two other aces-in-the-hole, SSG Vaughan, a wonderful friend from a previous base visit to Fort Jackson and SSG Espinosa, a previous Fort Benning handler, hustled behind the scenes to ready the kennels for our visit. 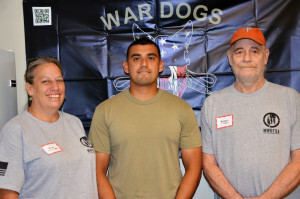 MWDTSA volunteer Jerry Whitman stands with some of the Fort Campbell dog handlers. Fort Campbell has a large kennel. In sports terminology, the bench is deep. After introductions, SSG IaFelice invited us to walk through the facility. Handlers stood beside their dogs’ enclosure doors. Our volunteers and guests were able to interact individually with each team. This allowed people to have more detailed and focused conversations while asking in-depth questions. These meet-and-greets allowed the handlers a moment to brag about their dogs. Seasoned veteran SSG Vaughn, in his role as a trainer, catches a young dog. Sharing his expert feedback will help the new handler determine how to adjust her training to ensure that she and her dog will become an excellent team. The levels of experience in this kennel guarantee that newer handlers and dogs have dedicated K9 professionals to lead, teach, and mold their younger comrades into polished, certified teams. 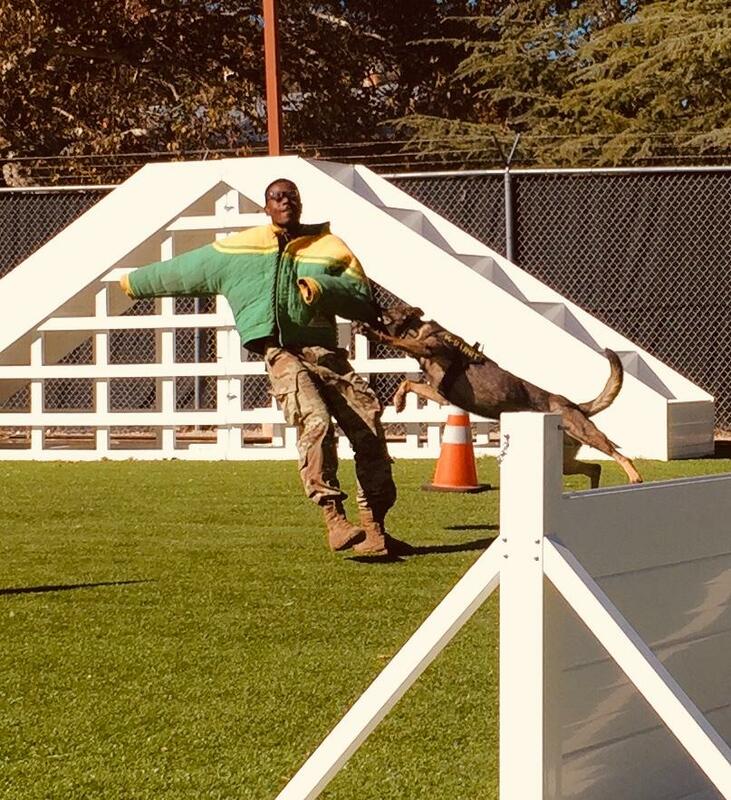 Some of them recently graduated from dog school, which means that MWDTSA guests witnessed a variety of skill levels both in handlers and in their dogs. It was inspirational to see the transfer of experience and knowledge during the demonstration exercises. 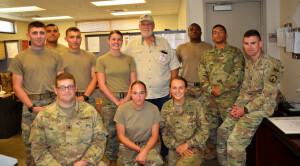 Four MWDTSA volunteers attended, along with some additional guests, including Ruth and Robert Conroy of the Betsy Ross Foundation. This foundation sends substantial support to our dog teams via MWDTSA. 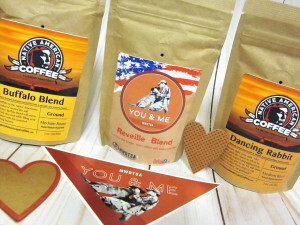 In their honor, we gifted the kennel at Fort Campbell with a small office Keurig machine. In a breathtaking coincidence, the flag flown on MWDTSA’s behalf as a thank you gift and presented to the Betsy Ross Foundation several years ago was originally flown for us by SSG Espinosa. A joyful smile spread across Ruth’s face when she met him. Ruth and Robert Conroy from the Betsy Ross Foundation flank their dogman, Jay Espinosa. MWDTSA never attends a base visit empty-handed. We brought KONGs and Chuck-It Balls for the dogs. For the handlers, we provided T-shirts, water bottles, and a gigantic decorated tub filled to the brim with tasty treats. The wonderful folks from the Betsy Ross Foundation also gifted a bottle of savory Allegro Marinade to all attendees. (Shout out to Allegro: We have switched marinade allegiance. Best. Marinade. Ever.) Additionally, MWDTSA provided a lunch of salad, Luigi’s pizza, drinks, and one of our guests brought a beautifully decorated MWDTSA cake. 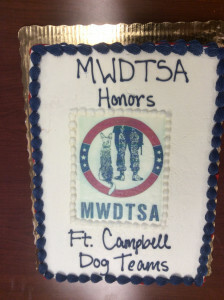 A great MWDTSA cake followed the pizza luncheon as a sweet surprise. As MWDTSA volunteers, we spend much of our time working independently from our homes scattered across the country. While that gives us a wide swath of reach, it also means our volunteers often work diligently with people they’ve never personally met. It was my absolute honor to meet volunteers Shelli and Randel from Nevada for the first time. They embody dedication, capability, and honor. I also treasure the personal introduction to Ruth and Robert, the fine folks behind the Betsy Ross Foundation. And, as always, the young men and women who work with our amazing military working dogs remain focused and fabulous. What a phenomenal experience for us all, thanks to the military working dog teams at Fort Campbell! MWDTSA thanks its generous donors for making stateside kennel visits possible. To learn more about how you can support our nation’s military working dog teams, visit https://mwdtsa.org/donate/. Launch us a Spotnik Rocket! 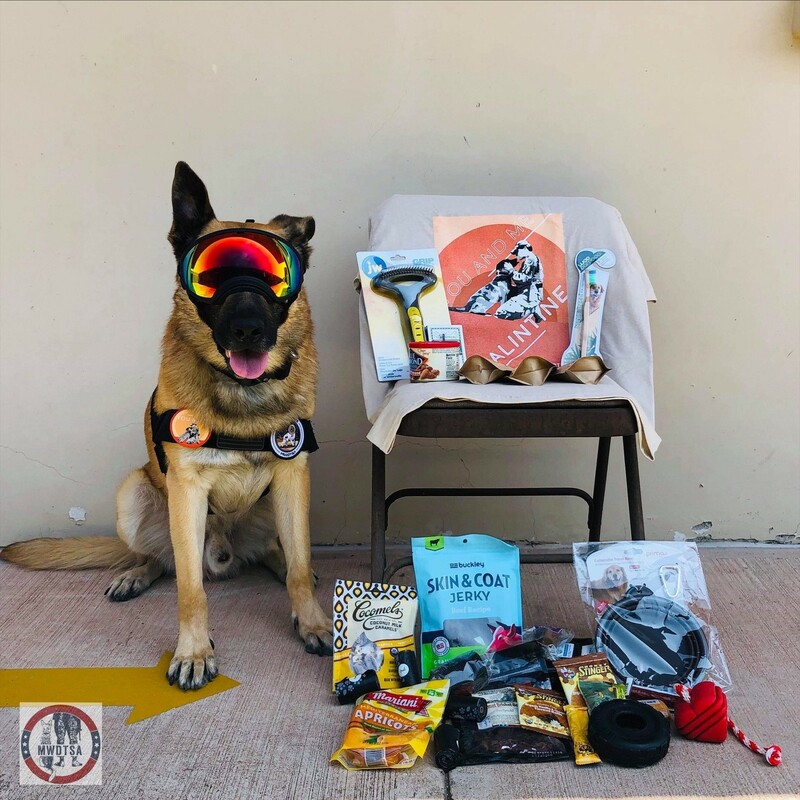 Colorado-based True Dogs, LLC is offering a generous matching program to help MWDTSA collect Spotnik Rocket and Asteroid toys for Q4-2018 care packages. CEO Adam Baker arranged a special donation link on his company’s web site for a Space Force Combo. Together, the Rocket and Asteroid toys retail for $26.00, not including shipping. When you donate via this link, however, you pay only $13.99. True Dogs is covering the remaining amount, giving MWDTSA two toys with shipping for the price of one. This is the 4th consecutive quarter that True Dogs, LLC has supported MWDTSA’s care packages. In Q1-2018, the company donated 200 of their clever Soda Pup Can Toys. 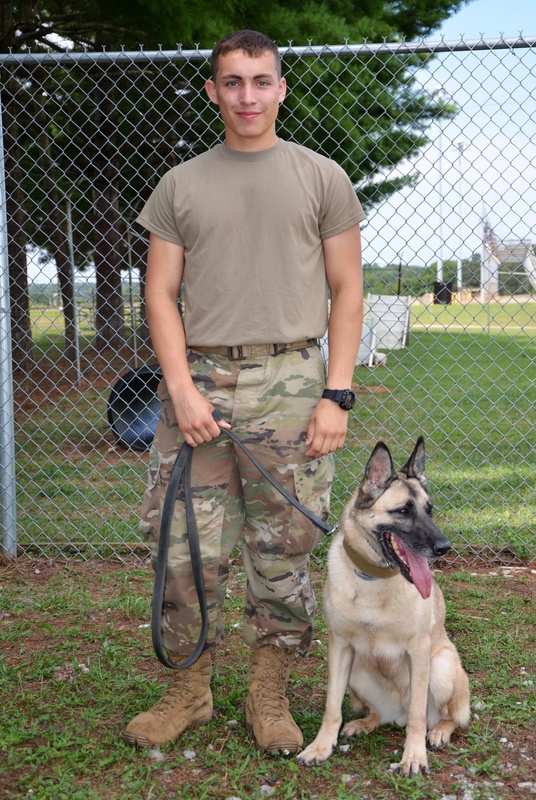 In Q2, they provided a matching program that enabled us to send the USA-K9 Grenade Reward Toy to deployed teams. 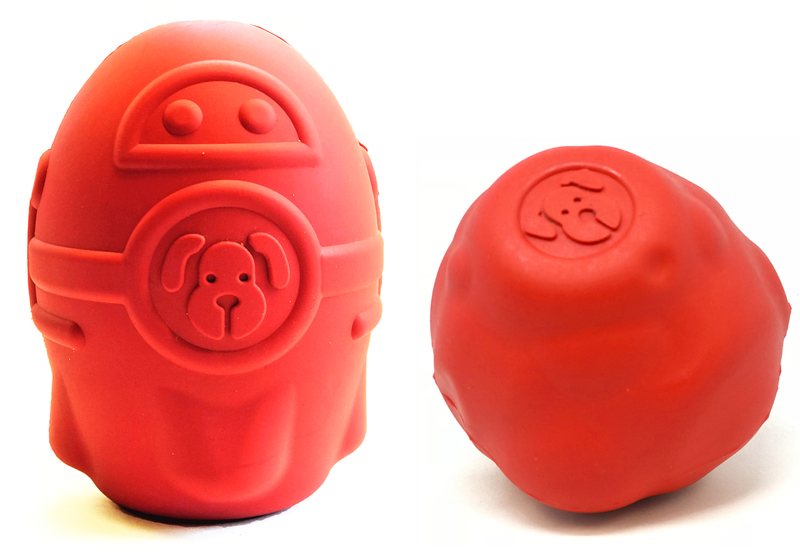 And thanks to a match in Q3, we included the USA-K9 Cherry Bomb Durable Chew Toy and Treat Dispenser in our boxes. Below, Adam answers a few questions about these creative product lines. MWDTSA: Your toys are so clever. What can you share about your company’s creative process? How do you come up with such out-of-the-box dog toy ideas as the Spotnik Rocket? AB: Dog owners are a diverse group of people, and yet most dog toys look alike—coming in predictable shapes like bones or resembling children’s toys (stuffed animals). At True Dogs, LLC, we try to understand the diversity of consumers and then build products that will appeal to targeted segments. We work hard to create products that are unexpected. The biggest challenge with making any consumer product is figuring out a way to build an emotional connection with the consumer. We hope that by creating toys in familiar shapes that the consumer already has an affinity for, they will become curious enough to pick our product off the retail shelf and give us a try. MWDTSA: Tell us about the rubber. Military working dogs tend to be hard on toys. AB: Manufacturers produce dog toys in lots of different materials, many of which are called rubber. However, not all materials are alike. The vast majority of dog toys are made from thermoplastics which are petroleum-based products. These include synthetic rubber, TPR (Thermoplastic Rubber), TPU (thermoplastic urethane), EVA (Ethyl Vinyl Acetate). The problem with these materials is that they may or may not be safe for your dog, and they are certainly bad for the planet because they won’t biodegrade. Our products are all made from natural rubber. The raw material comes from rubber trees. This is a sustainable crop, and the material will ultimately biodegrade (although not in your lifetime). The rubber is non-toxic and FDA compliant. It is perfectly safe to have in your dog’s mouth even if he ingests bits of the material. By reducing inexpensive fillers and maximizing the amount of pure latex, our material has superior durability and tear strength. Because our compounds are made in the USA (not China), we have much tighter control over our proprietary formulations, ensuring both quality and safety. 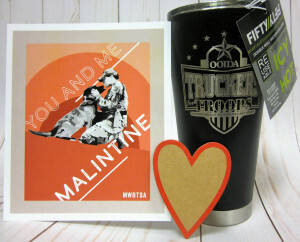 MWDTSA: Is there anything else you would like to share with readers? AB: The more toys you donate, the more matching toys we can send, and we are excited to be able to support MWDTSA in this way. MWDTSA is grateful for True Dogs, LLC’s ongoing support! The annual KONGs for K9s drive kicked off on August 1 and will continue through December 31, 2018. It’s a collaboration between MWDTSA and KONG Company. The matching program helps us provide KONG toys to military working dog teams deployed in global combat zones. Pet stores, clinics, and other dog-loving enterprises pick a month or more to take part. You collect one or both of the specific KONG toys shown in the photo above: https://www.kongcompany.com/products/for-dogs/rubber-toys/extreme-rubber-toys/kong-tires/ and/or https://www.kongcompany.com/products/for-dogs/rubber-toys/interactive-rubber-toys/tails/. MWDTSA will provide you with posters for your store, describing the initiative. You order in a supply of the toy and create a display to draw customers’ attention to the matching program. Some retailers place the display by the register and ask every customer, “Would you like to donate a KONG to a military working dog deployed in a global combat zone?” This active approach often results in more donations. Your patrons purchase the KONGs at regular retail price (or whatever price you set) and leave them with you at the register. Some stores set up visible donation bins so that customers can see the number of donated toys. Other stores tuck the donated KONGs in a back room. 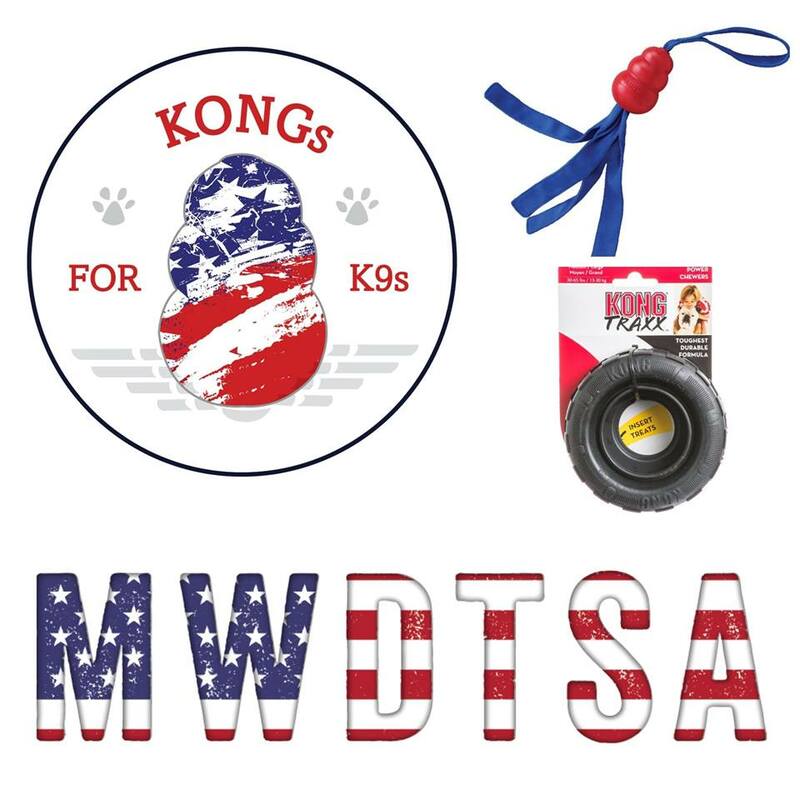 At the end of the drive, MWDTSA will pick up the donated KONGs from your store, if we have a volunteer in your local area. If we don’t have a volunteer near your store, we will provide shipping instructions on how to get them to us. Once we receive your toys, we document the quantity and notify KONG. For each toy donated by your customers, KONG is matching with a second toy. There’s still time to sign up for 2018. Just contact president@MWDTSA.org if you’d like to take part. Indicate the name and address of your organization. Also, specify which month works best for your KONG donation drive, and which toy above you’d like to collect. We will get the posters to you right away. While most KONGs for K9s participants are pet-related businesses, that’s not a requirement. In 2017, our largest KONG total came from Veterans United Craft Brewery. We also received KONGS from CrossFit Invasion, a fitness studio in New York!